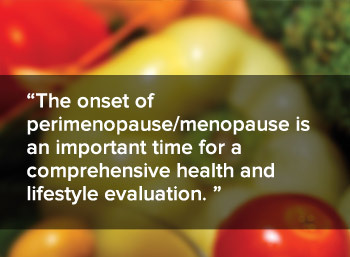 The onset of perimenopause/menopause is an important time for a comprehensive health and lifestyle evaluation. A comprehensive medical history and complete physical exam are essential prior to initiating menopausal hormone therapy (HT) of any kind. Additionally, there should be at minimum, a subjective assessment of cardiovascular health, bone health, glucose, and breast, ovarian, and uterine health. DEXA testing, lipid profiles, glucose testing and screening mammography according to national guidelines, age, and based on medical judgment and patient preferences. Other selected tests depend on age, symptoms, and other medical history. But…what about “testing for menopause”? There is no one test for a menopausal woman. Tests to determine ovarian function are not routine because the diagnosis of perimenopause or menopause is largely able to be made based on the medical history. As practitioners, hormone testing can be used on an individual basis, mostly to differentiate menopause from thyroid problems, abnormal causes of a lack of menses such as elevated prolactin levels, or premature ovarian failure (premature menopause). Tests such as the follicle stimulating hormone (FSH) test are not as accurate as we would like in a perimenopausal woman. The difficulty with FSH tests are that they can fluctuate immensely during perimenopause - what a patient’s FSH is on any given day is not meaningful as to perimenopause changes or not. For a woman who is still having menses, especially irregular/random and eventually infrequent cycles as is the case in perimenopause, her FSH fluctuates unpredictably and it can easily be within normal range on one day and elevated on another. In fact, FSH tests are frequently normal in perimenopausal women and a physician with lack of expertise in menopause/midlife women will mistakenly then attribute the origin of her concern to mental health or unknowns, rather than the proper diagnosis of perimenopause. 1. If a woman is suspected to be perimenopausal or menopausal and is using contraception, the FSH can be useful in determining if she still needs contraception. A FSH above 30 mIU/mL, and then when repeated one month later is also above 30 mIU/mL, then a diagnosis of menopause can be established and she will no longer need contraception. It is important to continue some kind of contraception during that one month period until this is determined. 2. If a woman is reporting irregular menses, irritability, fatigue, occasional sleeplessness, then I will order an FSH and a thyroid stimulating hormone (TSH) test to help sort out if her problems are perimenopause and/or hypothyroid. In my work with perimenopausal and menopausal women I have found that the best results come with being a studious reader of menopause medicine, listening intently to my patients, assuring the basics of a comprehensive history and physical exam, avoiding short cuts, being flexible to the individual needs of the patient and the individual demands of the case. Hormone testing or not, in the end, if we think smart, are trustworthy, behave honorably, proceed with good intentions and do no harm, we will help more menopausal women more of the time, and even most of the time. This is part 1 of a 3 part series on evaluating menopause by Dr. Tori Hudson. Learn more about evaluating menopause, in part 2 which highlights Hormone Testing of Estrogen and Progesterone and part 3 - Hormone Testing for Perimenopause - Is it Necessary?